This lodge has permission to perform the degrees in the Spanish Language. M. W. David W. Lovering, Grand Master; Wor. Aljadith P. Gomez, Master; R. W. George F. Shelton, D. D. G. M. Boston 2nd District, and members of Logia America. 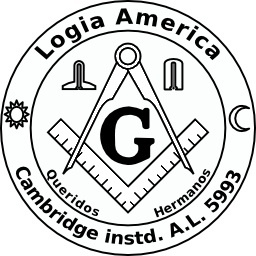 On Friday, November 17, 1995. at the Masonic Hall in Cambridge, Logia "America" was constituted by Ike Grand Lodge of Masons in Massachusetts. The ceremony was open to the public and approximately 150 members and guests were present. A reception was held in the dining room following the ceremony. M.W. David W. Lovering, Grand Master, presided. He was assisted by R. W. Robert H. Hartley, Deputy Grand Master; and R. W. George F. Shelton, D. D. G. M., Boston 2nd District.